of a yummy 5 course dinner for two at the Chef's restaurant Bar Cento. Renowned Cleveland Chef Jonathon Sawyer is offering a five-course meal for two, with wine pairings for each course, at his newest Cleveland venture, Bar Cento. Based on an Italian neighborhood bar, Bar Cento is a place to have a drink and good food while conversing with friends. 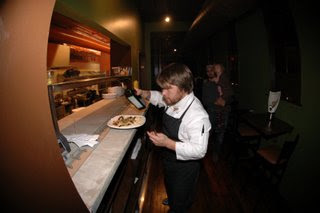 Chef Sawyer is very environmentally conscious and uses northeast Ohio foods. His menu includes antipastos, pizzas, pasta dishes, brick-oven chicken, grilled and seared fish, and grilled bone-in strip loin.